It’s almost an understatement to say that the Rosewood Hotel Georgia likes to do things in a big way. Even before the first guest checked in on July 15, 2011, the grand hotel made world-wide headlines during the 2010 Winter Games as the home of the world’s largest Canadian flag, constructed to hide the extensive renovations on the 13-storey, 1927 Georgian Revival heritage building. In keeping with the hotel’s ethos, the public spaces are just as impressive. The gilded and mahogany-paneled lobby (where, in 1950, movie star Katharine Hepburn coined the phrase “room service” by handing then-manager Bill Hudson a written dinner order to be sent up to her suite) is a faithful reproduction of the original, down to the refurbished clock face mounted over the Howe St. entrance. Not to be outdone by the Vancouver Art Gallery across the street, the owners have amassed to the largest private collection of Canadian art in the country. Artist, author and Renaissance man Douglas Coupland’s re-imagining of iconic works by the Group of Seven stands guard over the private elevator that takes guests to Reflections, the hotel’s fourth-floor open-air bar and grill. For its part, the “1927” lobby bar juxtaposes two canvases by Montreal-born Canadian abstract master Guido Molinary with a circular wood carving by local First Nations artist Ray Natraoro. It’s the perfect spot to sip the hotel’s eponymous cocktail, The Hotel Georgia, a vintage mix of Plymouth Gin, orgeat, lemon juice and orange blossom water topped with an egg-white foam and dusted with nutmeg. Just behind the sweeping grand staircase, another medallion — this one a clever jigsawing of drift wood by North Vancouver master woodworker Brent Comber — marks the “hidden” staircase leading to the not-yet-opened basement jazz club, Prohibition. (Hotel reps say they’re looking at a December launch.) Perhaps most importantly, just past the original brass Royal Post box by the Georgia Street entrance, is Hawksworth, Chef David Hawksorth’s eponymous restaurant and the grandest dining room in the city. Pride-of-place has been reserved for Vancouver artist Alan Wood’s ‘Garden Series,’ a modernist triptych, on display behind the check-in desk, inspired by the backyard of celebrated Vancouver restoranteur John Bishop. And, directly across from that, the trippy, three-dimensional “reverspective” of Venice created by Wood’s pupil, the internationally renowned Patrick Hughes. 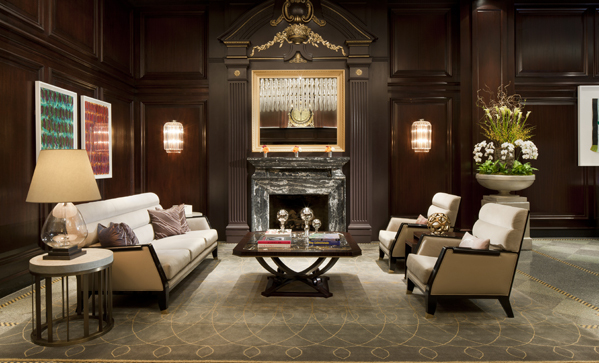 Image courtesy of Rosewood Hotel Georgia.